Add onions and cook, stirring constantly until softened, 3 to 4 minutes. Add squash, pears, garlic, ginger and thyme; cook, stirring, for 1 minute. 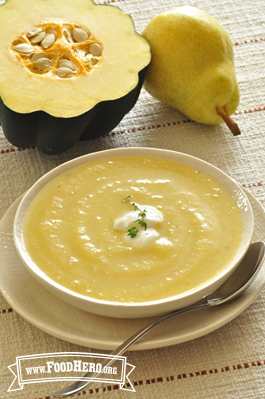 Reduce heat to low, cover, and simmer until squash is tender, 35-45 minutes. Return soup to pot and heat through. Stir in lemon juice. Garnish each serving with a spoonful of yogurt.